Regarding EVs in Europe, the biggest news this year will be the commercial launch of the Renault Zoe, but another electric will soon follow the Zoe, and that is the electric version of the Volkswagen Up!, the E-Up! or e-up! as we don’t know yet how Volkswagen will call it exactly. What we know is that it should carry a 60-kW motor with a battery pack of at least 16-kWh. That battery seems quite small, but the price will be related as Volkswagen’s expect to set it below €25,000 in its home country. That is for the complete car, with battery included, and without any incentive. It is pretty good considering the Nissan Leaf currently sells at €36,990 in Germany. 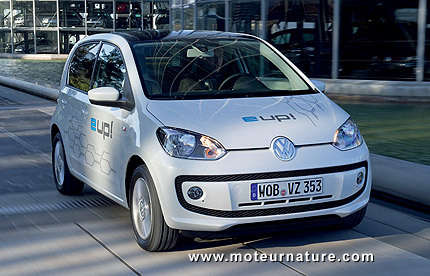 We also know that there will an electric version of the Skoda Citigo (a sister model to Volkswagen Up! ), and that it should be at least €1,000 cheaper than the VW, like the gas version. The Leaf cost in Germany 33.900, check de Nissan.de website. That is correct today, but the price mentioned above was right when the article was written.